Hold an event where your audience is more receptive to the message you and your speakers will share. I help participants let go of their worries, be present and connect with each other and the message you want to deliver. ​Let’s create a space where magic can happen! Focused on corporate social responsibility? Have or are looking to implement wellness programs for your staff? Interested in making social change? Ahead of others in your thinking and innovation? Wanting to raise the consciousness of how people work and learn? Then I know how important it is for you to have an event that will not waste people’s time and deliver a lasting impression. MACRO Leaders is a model that I have developed to guide my work in transforming leaders and organisations. The acronym MACRO stands for: Mindfulness, Authenticity, Courage, Resilience, and Openness. Do you want to deliver a message that makes an impact and that is not forgotten as soon as participants leave the room? I help what you teach be remembered and part of your audience’s consciousness. 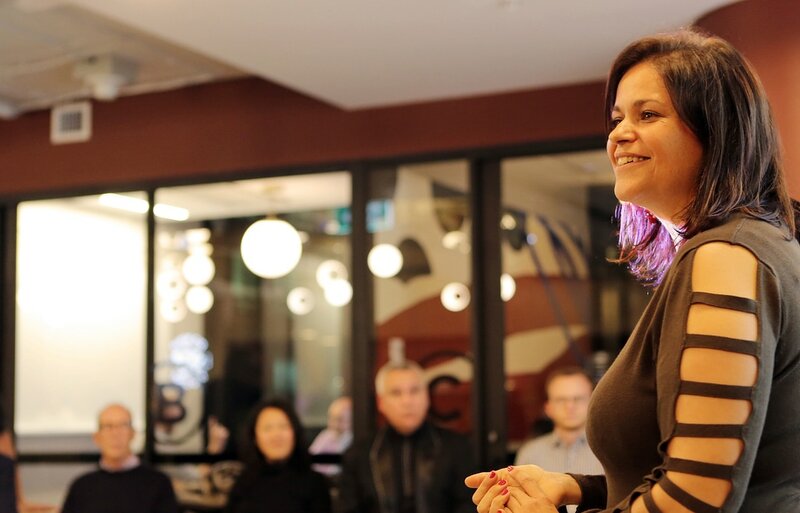 Whether you need an intro, acknowledgment of country or meditation for 5 minutes at the start of your event or facilitation over a 3 days retreat, I can help! I become not only your facilitator, but your on-site main room coordinator, where I work with your team and create a space that will support the delivery of your message in the way you imagined it to be. I have modelled this package off of the seminars of world-class speakers like Tony Robbins where everything is perfectly choreographed to deliver what you need – from the music to the chair arrangement to how your team supports the audience. It is the subtle and subliminal messages that a room and staff send to the audience that make the difference between a memorable event and one where your message does not quite hit the mark or create the lasting change you want. A cluttered room that does not allow for flow and movement can lead to a mind not open to learning. Instead of needing a full team like the top speakers in the world I will become your “awareness team”. A “set the intention” meeting on the day of the event so I am clear on your outcomes. I will work with your AV team, volunteers or other staff to ensure your itinerary is supplemented with the right support you need. I will intro you or your speakers, incorporate exercises and activities we decide on throughout the event and send the audience to and from breaks. A debrief meeting after the event so you know what was amazing and also have notes of what you would do differently in the future. Normally you would be too tired to worry about this step yet it is one that will help your events get better over time. Contact me below and we will set up a fifteen minute conversation to understand what you need and how we can make your event a success! Based on your requirements and whether you need an individual exercise or are interested in my signature package I will come back with a quote. Once agreed upon I require a 25% non-refundable deposit to hold the date. Full payment is due no later than 3 days before event. Contact me now on 0466 322 399 to ensure your date is not booked!